Life is Beautiful kicks off in Vegas on Thursday, with a star-studded music line-up and food from a huge array of local restaurants. If you perused the massive menu, you probably realized that figuring out what and where to eat is a daunting task. So we scored an inside hook-up to help us navigate. 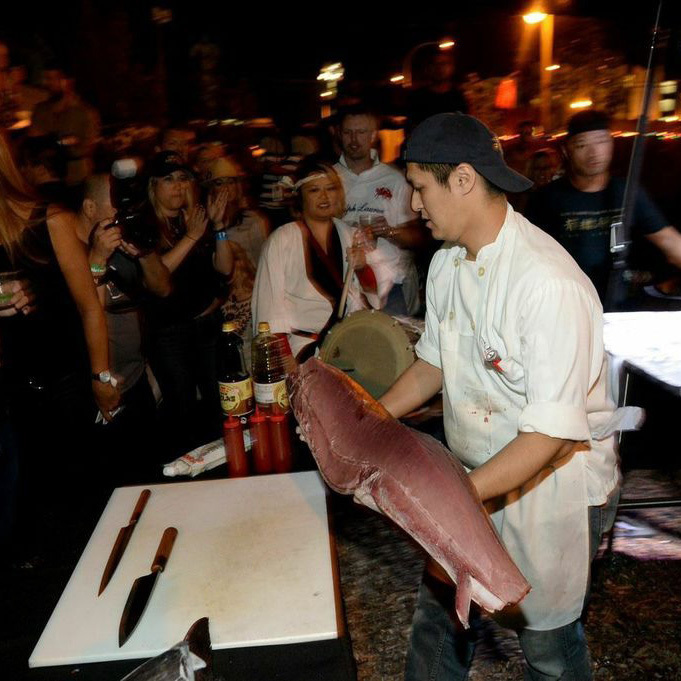 Here, Bruce Bromberg, chef-owner of Blue Ribbon Sushi and the co-chair of the festival’s culinary committee, offers some of his best tips for finding the best food this weekend. How did you get involved with the food at Life is Beautiful? A few years ago I was eating at the Cosmopolitan in Vegas with festival founder Rehan Choudry. We talked about how it would be cool to put food and music on an equal plane. The first idea was a 2,500 person festival and I would cook all the food. Obviously that’s not quite how it turned out. Our first year was 70,000 people and this year we’re expecting over 90,000. What’s new to eat this year? Sam Marvin, who owns Echo & Rig and is one of the best chefs in Las Vegas right now, will be making a spit-roasted lamb at the kickoff event on Thursday as well as cooking and doing demos throughout the weekend. Nancy Silverton is also cooking on Thursday for the first time. How did you select which chefs would participate? The criteria was people who were super passionate about what they do and would be open to a slightly different format. One of the main things I said to everyone was get your mind away from the grand tasting. You’re not going to be delicately preparing dishes and placing them in someone’s hand. I needed people who wanted throw a party—cook big pieces of meat. Make it a bit more familial and less orchestrated. What are 3 things everyone has to eat this weekend? The carnitas from Hubert Keller, the turkey leg from Yusho, and for sure the fried chicken sandwich from Kim Canteenwalla and Honey Salt. Whenever we go to festivals we start dragging by the middle of the day. Where can people go to recharge? The solar soup kitchen with José Andrés. It’s out of the sun and we’re going to have numerous chefs who will just be cooking there all weekend. It’s a good place to have what we call “tuna moments.” Last year we just pulled out a 180-pound tuna in the middle of the day, sliced it up and gave it out. There are going to be a lot more tuna moments this year. You might end up with José whipping up a paella unannounced right next to you. What’s the best food deal this weekend? What Nobu is doing again this year is amazing. They’re basically building a pop-up restaurant where you can get sushi, sashimi, black cod—a lot of the things they’re known for. EDITOR’S NOTE: This might be the only time in your life you’ll be able to get Nobu sashimi for $8. Any cooking demos people should check out or inside scoops? Definitely Donald Link from New Orleans. He is cooking with Questlove. He’s doing a Boudin from his restaurant and Quest will be his sous chef.